Did Barack Obama torpedo his own ‘Asia pivot’ strategy at G20? Can the United States recover its position in East Asia and the Indo-Pacific, or has the tide turned, isolating Washington’s support base in the region? Growing evidence now points to the reality that the last major summit attendance of U.S. President Barack Obama — the G20 Leaders’ Summit in Hangzhou, in the PRC, Sept. 4-5 — brought the U.S. Asian strategy [“Asia Pivot”] and posture to their lowest ebb since World War II. To begin with, and despite a major upgrading in U.S. defense cooperation with and support for the Philippines, it now seems clear that President Rodrigo Duterte has backed away from solidarity with the U.S. on confronting the PRC, and has even indicated that he would not pursue the decision of an international tribunal at The Hague, rejecting the PRC’s claims — overlapping those of the Philippines’ — to islands, waters, and activities in the South China Sea. The G20 Leaders’ Summit proved to be a débâcle for President Obama, a disaster of his own making, with the culmination of a series of missteps coming into evidence at Hangzhou. The deliberate gesture of mishandling President Obama’s arrival on his Air Force One B.747 transport aircraft at Hangzhou Airport was calculated to be the PRC’s “send-off” to the U.S. President, highlighting the near-total collapse of his (and therefore U.S.) prestige in the eyes of PRC President Xi Jinping. That show of confidence by the PRC, and the ability to snub the U.S. President with impunity, has set the tone for concern in the region over the U.S.
Beijing had a long time to work up to this point, given the extensive set of meetings of various levels of officials and cabinet ministers from the G20 nations; this was the year of the PRC’s Presidency of the G20. But the tipping point came well before the Summit, when President Obama, before he embarked for Hangzhou, warned Philippines President Rodrigo Duterte that his approach to “human rights” was not what the White House wanted to see. Then, on September 5, 2016, in Hangzhou, and before departing for Vientiane, Laos, for the ASEAN Summit at which the Philippines was due to take over the Presidency of ASEAN, President Obama said publicly that human rights would be brought up in his discussions with President Duterte. Then, during the ASEAN Summit, President Duterte “purposely did not attend” (as he said) a number of meetings, including bilateral talks with President Obama. But he did meet with PRC Premier Li Keqiang during the summit. It was their first meeting since President Duterte was sworn-in on June 30, 2016. Premier Li said that he hoped that the two countries could work together to bring bilateral talks back to normal, and that bilateral relations could “realize healthy, stable development”. President Duterte said that Premier Li’s remarks represented his own principles, and that improving relations with China was his “active desire”. The Philippines, under President Duterte, has also stipulated that it would not participate with the U.S. and U.S. allies in freedom of navigation exercises in the South China Sea in order to avoid offending the PRC. This reversal of the previous Philippines’ Government strong legal challenge to the PRC on South China Sea issues was further compounded when, on Sept. 12, President Duterte said that U.S. Special Forces operating in Mindanao would have to leave. He said: “I do not want a rift with America. But they have to go.” U.S. officials, from President Obama down to Deputy Assistant Secretary of Defense for South and South-East Asia Cara Abercrombie, tried to brush the Philippines’ position aside. Ms Abercrombie, speaking on Sept. 12, at a function on Capitol Hill for the launch of the Asian Research Network’s Survey on America’s Role in the Asia-Pacific, merely said that U.S.-Philippines defense cooperation was expanding. But the reality is that President Duterte himself is not consulting or cooperating with the U.S., and has completely moved toward the PRC, believing that the U.S. can no longer protect the Philippines. 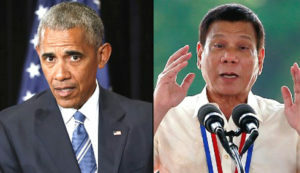 President Obama’s, and the U.S. State Department’s, public pressure on human rights issues angered President Duterte, just as similar remarks by U.S. Secretary of State John Kerry, threatening Djibouti President Ismaïl Omar Guelleh on May 5, 2015, led directly to Djibouti asking the PRC to establish a military base there. As well, apart from pushing Manila into the arms of Beijing, Obama’s Washington has abandoned treaty partner the Republic of China (ROC: Taiwan), and with these two events has abandoned the concept of using the First Island Chain for military-strategic influence over the sea lanes which are critical to Japan, and the Republic of Korea.